It’s a competition that starts with a “Purification,” includes a “Sacrifice,” “Beheading” and “Judgment; and for Las Vegas bartender Greg Black, it ended with a “Championship.” A bartender since 1997, Black, best mastered the nine-step Belgian beer pouring ritual Tuesday night to win the Stella Artois Draught Master Competition held at Lavo Nightclub. Black will now represent the U.S. against more than 30 other countries at the World Draught Master Competition in Leuven, Belgium this October. The Draught Master Competition recognizes the best bartenders for their ability to adhere to the Belgian Pouring Ritual – a nine-step process that includes “purifying” the glassware; “sacrificing” the first beer poured and “beheading” the beer for the perfect head of foam. The timed competition took place in front of a panel of four judges as well as a large audience of consumers and industry experts. Judges graded the competitors on their ability to pour a perfect glass of Stella Artois and Hoegaarden from draught. Competitors also were judged on how well they opened, poured and served bottles of Stella Artois, Hoegaarden and Leffe Blonde. Judges were looking for the perfect pour as well as a showcase of skills, style and personality. 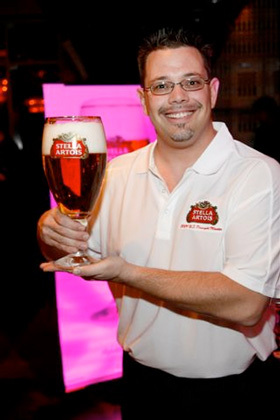 In 2008, U.S. champion Anthony Alba finished fourth in the World Draught Master finals. It was the highest finish for an American since 2005 when Jessica Waltz took first.